Rivaling the staying power of Hollywood’s most iconic franchises — think Harry Potter and James Bond — Universal’s Furious 7 raced to a $143.6 million debut at the North American box office and $240.4 million overseas for a massive worldwide launch of $384 million. The $190 million movie broke numerous records, delivering a series best and the biggest launch for any movie domestically since The Hunger Games: Catching Fire in November 2013. Globally, it is the fourth-highest opening of all time behind the final Harry Potter film ($483.2 million), Harry Potter and the Half-Blood Prince ($394.4 million) and The Avengers ($392.5 million). And its foreign gross of $240.4 million from 63 markets makes it the No. 3 international opening of all time and the biggest start for a Universal title, even without China, where it rolls out April 12. Furious 7 came in No. 1 in every territory, led by the U.K. ($19 million), Germany ($15.2 million), France ($11.4 million) and Australia ($11.2 million). Furious 7 — the final film featuring the late Paul Walker — is the second major victory of the year for Universal Pictures chairman Donna Langley and her team after Fifty Shades of Grey, which on Good Friday jumped the $400 million mark overseas for a global cume of $566 million through Sunday. The desire to see Walker one last time no doubt contributed greatly to Furious 7‘s stunning performance. Universal intended to open the seventh installment on July 11, 2014, but production was halted in November 2013 when Walker died in a tragic car crash during a Thanksgiving hiatus. As with previous installments, Furious 7 played to a diverse crowd, with non-Caucasians making up 75 percent of the audience. Hispanics made up the majority of ticket buyers (37 percent), followed by Caucasians (25 percent), African-Americans (24 percent), Asians (10 percent) and other (4 percent). Gender-wise, the turnout was fairly even, with males making up 51 percent of the audience. In terms of age, 66 percent of the audience was over the age of 25. Furious 7 marks the top opening ever for the month of April, and further proves that tentpoles can do huge business outside of summer. Captain America: The Winter Soldier was the previous record holder with $95 million on the same weekend a year ago. Thanks to Furious 7, total weekend box office revenue was up more than 31 percent over 2014, and more than 65 percent over the same frame in 2013. Helping to eradicate a troubling downturn at the U.S. box office in 2014, Furious 7 peeled out with the biggest opening since Catching Fire ($158 million). Furious 7 earned $67.3 million on Friday alone, the 10th-best showing of all time, narrowly edging out The Dark Knight and The Hunger Games ($67.2 million each). Furious 7 easily ouptaced any previous title in the franchise, including blockbuster Fast and Furious 6, which topped out at $789 million worldwide. Furious 7 came in 23 percent ahead of that film’s four-day launch over Memorial Day weekend in 2013 ($117 million), and 47 percent ahead of its three-day take ($97 million). 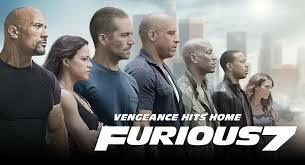 This time out, the plot pits Vin Diesel’s Dominic Toretto and crew (which includes Michelle Rodriguez and Tyrese Gibson, among others, as well as Walker) against Jason Statham’sDeckard Shaw, out for revenge after the death of his brother. Dwayne Johnson also reprises his role as Hobbs. After Walker’s death, director James Wan, writer Chris Morgan and Universal pored over existing footage and tweaked the script, with production resuming in April 2014. To complete the film, CGI and voice effects were used in some scenes featuring Walker’s detective character, BrianO’Conner, with Walker’s brothers, Caleb and Cody, used as stand-ins. Earning an A CinemaScore, Furious 7 boasts the widest release in Universal’s history, playing in 4,004 theaters domestically and on more than 10,500 screens overseas (in addition to China, it has yet to open in Russia and Japan). Imax locations delivered an April record, including $14 million in North America from 365 locations and $8 million overseas. Universal is planning three more installments in the franchise but hasn’t announced any details, including whether Wan will return to direct. It goes without saying that Furious 7 made life difficult for the competition. DreamWorksAnimation’s family offering Home held in the best, coming in No. 2 in its second outing with $27.4 million for a domestic total of $95.6 million. Still, even it dropped 47 percent, a bigger decline than usual for an animated film and likely a result of some families choosing Furious 7. Overseas, Home earned another $20.7 million for a foreign total of $85.2 million and global cume of $180.8 million. The Will Ferrell–Kevin Hart comedy Get Hard took a big hit, falling a steep 62 percent to $12.9 million for a 10-day domestic total of $57 million. Internationally, where it is a far tougher sell, the R-rated comedy grossed $2.6 million from nine markets for an early foreign cume of $10.3 million and global total of $67.3 million. Domestically, Get Hard came in No. 3, followed by Cinderella andInsurgent. On Monday, Disney’s Cinderella will jump the $400 million mark after finishing Sunday with a domestic haul of $167.3 million and international cume of $230 for a total $397.3 million. To date, it is the top-grossing title of 2015, including a China bounty of $68.7 million. Insurgent crossed the $100 million mark domestically for a total $103.4 million. Overseas, it has earned $120.2 million for a global cume of $223.6 million. Elsewhere, Radius-TWC and Dimension took a gamble in further expanding critically acclaimed horror film It Follows this weekend despite the onslaught of Furious 7. The film, upping its theater count from 1,218 to 1,655, grossed $2.5 million to come in No. 6. It Follows‘ cume is $8.5 million. At the specialty box office, The Woman in Gold, starring Helen Mirren and Ryan Reynolds, succeeded in providing a refuge for older adults not so interested in Furious 7. The movie, opening in 258 theaters in select top markets, grossed a solid $2 million to come in No. 7, despite its small footprint. From The Weinstein Co., Woman in Gold earned an A CinemaScore, with nearly 70 percent of ticket buyers over the age of 50. “The theater average of $7,677 was extremely good, and the exits were as good as for The Imitation Game and The Artist,” said TWC’s Erik Lomis, adding that the movie will expand nationwide next weekend, playing in 800 to 1,000 theaters. The long-delayed biographical drama Effie Gray, starring Emma Thompson and Dakota Fanning, quickly fizzled, earning just $501,000 from 201 theaters for a dismal theater average of $746.